New landmark: Chua with a model of Icon City. PETALING JAYA: The vacant plot of land that used to house Panasonic air-conditioner plant at the intersection of Federal Highway and Damansara Puchong Highway (LDP) will soon get a new landmark with the planned development of the Icon City project. Built in the 1970s, the plant in SS9, Petaling Jaya, has been left vacant for the past four to five years since Panasonic relocated its factory to an industrial zone in Section 21, Shah Alam. The 20-acre site was acquired by Mah Sing Group Bhd in 2009 from vendor, Panasonic HA Air-Conditioning (M) Sdn Bhd, for RM89mil or at RM104 per sq ft. The parcel has a few advantages high visibility with direct frontage to two busy highways the LDP and Federal Highway; good connectivity to multiple highways; and proximity to the KTM stations in Seri Setia, Setia Jaya and Kelana Jaya. “The plot is sizeable enough for a comprehensive masterplan to optimise the potential of the land for a well-planned and designed integrated commercial development,” Mah Sing Properties Sdn Bhd chief operating officer Andy Chua told StarBiz in an interview. However, he conceded that one of its main shortcomings was the traffic congestion at the intersection of Federal Highway and LDP. To improve traffic flow at the junction, Chua said Mah Sing had engaged traffic consultants, who came out with a proposal for a comprehensive traffic dispersal system that would involve about 13 new ramps, two tunnels and road widening work to eliminate the need of traffic lights for cars travelling in and out of the two major highways. “We are looking at spending RM200mil in infrastructure work with various access points for traffic dispersal,” he said. “It will be an architectural marvel within a green and sustainable development and is poised to be among the first in South-East Asia to be certified by Leadership in Energy and Environment Design, USA; Green Building Index, Malaysia; and Green Mark of Singapore,” Chua added. The project, with a gross development value of RM3.2bil, will be undertaken in two phases over seven to eight years. The first phase was launched last month and includes 30 units of seven and eight-storey shop offices dubbed the “Jewels”; 46 single and double-storey retail shops, two towers of 411 units of small office-versatile offices (SoVos), two towers of 570 units of serviced residences; and a block of boutique office tower. These properties are expected to be completed in three to four years. The remaining phase will comprise a hotel, corporate office towers and a retail mall. There will be three levels of basement parking with 3,800 parking bays in phase 1 and 5,000 bays in the subsequent phase. Chua said the company also planed to have a green park on top of a four-floor parking podium as open space for recreation. Chua is confident that the properties will be popular due to the affordable pricing and lack of such properties in the vicinity. “The market catchment is extensive, including matured and affluent neighbours such as Kuala Lumpur, Subang Jaya, USJ, Shah Alam and Damansara,” he said. Since the launch of Icon City on July 17, close to RM430mil sales have been recorded. For the current financial year ending Dec 31, Mah Sing has targeted sales of RM2bil, of which Icon City is estimated to contribute RM460mil. Property developer Mah Sing Bhd has recorded sales and bookings worth RM190.6 million with the launch of a commercial project and previews of two residential projects over the weekend. In a statement today, Mah Sing Group Managing Director/Chief Executive Officer Tan Sri Leong Hoy Kum said all 78 units of retail lots in Star Avenue@Damansara, Sungai Buloh, valued at RM71.7 million had been snapped up. The company also recorded a strong take up of close to 75 per cent of the Kinrara Residence luxury bungalows and semi-detached homes in Puchong. JOHOR BARU: Crescendo Corp Bhd (CCB) is set to launch its new mixed development property project, Bandar Cemerlang township with a gross development value (GDV) of RM2.5bil by the year-end. Chairman and managing director Gooi Seong Lim said the project would keep the company busy for the next 12 to 15 years. Once completed, he said the township would have about 15,000 units of mixed residential and commercial properties, of which 90% residential and 10% commercial properties. The township spans on a 562.51ha site, whereby 349.64ha is located in Mukim Tebrau of the Johor Baru district and 212.86ha in the Kota Tinggi district. “The completion of the Johor Baru-Kota Tinggi highway in June this year will definitely improve accessibility and connectivity to our project,” Gooi told StarBiz recently. He expects the unique location of the township within Johor Baru and Kota Tinggi districts to be a strong selling point to attract prospective buyers. “We also see demand for properties in Kota Tinggi is on the upward trend in the recent years due to the district's close proximity to Johor Baru,” he added. Similarly, he said the company's on-going Nusa Cemerlang Industrial Park (NCIP) in Nusajaya would continue to perform well due to its strategic location to the Second Link crossing. So far, 63.97ha of the park's 213.26ha site had been developed, Gooi said adding the company would take about five years to develop the entire industrial park with a GDV of RM1.5bil. He said Singapore investors currently represented about 44% of industrialists operating at NCIP followed by Malaysians (34%), Germany (6%), the United States (15%) and South Korea (1%). “We expects NCIP and Bandar Cemerlang to be the main contributors to the company's future earnings in the next few years,'' said Gooi. For the financial year ended Jan 31, 2011, Crescendo recorded RM39.43mil net profit on RM215.22mil revenue against RM19.35mil and RM160.32mil respectively in the previous financial year. PETALING JAYA: Even as a boy growing up in a small mining town called Pusing in Perak, he was certain of one thing - he wanted to lead. 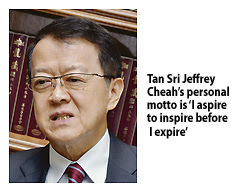 Tan Sri Jeffrey Cheah, the man behind the development of resort township Bandar Sunway, knew back then he would one day become a leader of some sort. A business graduate of Melbourne's Victoria University, Cheah started his career as an accountant but soon "became restless" being just an employee. His wish of becoming a leader began at a derelict tin mine, not far from the busy town of Petaling Jaya, where he dreamed of building something which "I can share with the rest of the world". And the road to that dream was not all a bed of roses. Recalling his entry into the business world, Cheah said it was not easy as he had approached banks without any track record. However, his determination won the bank over. Then, the recession came in 1985 and his company lost RM30 million due to its financial leasing business. A year later, armed with a non-impressive balance sheet, he went to Hong Kong Bank for a loan of RM5 million and a promise that he would pay back every single sen.
"Not once did we ever ask for a haircut and true, we paid all our debts," he said. But, another economic storm came in 1988, the same year he began his property business. It could not have been any more challenging, he said, but like they say, the rest is history. Now Bandar Sunway has over 30 million visitations yearly, a thriving RM10.6 billion township and home to over 50,000 people. Cheah still has plans for the township, hoping to turn it into an education hub or "the Boston of Malaysia" as it banks on five-star ratings of Monash University and Sunway University to grow the number of students to eventually reach 50,000. "The two trying times were a great lesson for business people like me. I don't believe in regrets but more in the lifelong pursuit of continuous improvements. In business, when you are in a slump, you simply cannot panic ... intelligent failure needs to be embraced." He noted with pride that in terms of business achievements, building Bandar Sunway and Sunway City Ipoh are his greatest successes. While his personal success comes from his idea to set up the Jeffrey Cheah Foundation (JCF) - where he had transferred all his shares worth RM700 million previously held under the Sunway Education Fund. In the JCF, the shares will be held in perpetuity and can never be sold. The foundation will ensure that all assets, funds and operating surpluses are used to perpetuate the cause of bringing quality education to deserving Malaysians. "I believe the best way to give back to the society is through the gift of education because it has the power to eradicate prejudices, correct biases and move nations." Cheah said his personal motto of "I aspire to inspire before I expire" has been the key motivator to his passion to succeed and doing business with a heart. Petaling Jaya: The enlarged Sunway Bhd, with total assets of RM7 billion and a market capitalisation of over RM3.5 billion, has been offered a sizeable piece of land in India for a possible township development. Sunway group founder and chairman Tan Sri Jeffrey Cheah said the development will be in one of India's "major cities". He, however, declined to disclose more details because no agreement has been finalised. "But we are looking at the offer seriously," Cheah told Business Times. Such offers from foreign property players are not uncommon for Sunway, he said, attributing it to his success in developing a piece of derelict mining land into a thriving township, that is Bandar Sunway. In a recent interview, Cheah said while India is a country with vast opportunities for the Sunway group, moving forward, it will be Singapore and China that it would like to focus on. "We expect some 30 to 40 per cent from our bottomline to come from China and Singapore by 2015," he said, adding that despite the size of Singapore, Sunway still finds a lot of opportunities in the island. "Also in Singapore, we learn a lot because they are technologically advanced in many ways." While in China, the group has signed a collaboration agreement to participate in the development of Tianjin Eco-City with master developer Sino-Singapore Tianjin Eco-City Investment and Development Co Ltd for a RM5 billion gross development value (GDV) project in Tianjin Binhai New Area. Sunway was chosen to be the only Malaysian developer with other top regional developers, which include among others Singapore's Keppel Land, Taiwan's Farglory Group and Japan's Mitsui Fudosan. Cheah said in expanding to the region, the group will continue to identify places with high growth in their population and per capita income, and build strong relationships with local partners. He said the group will definitely leverage on its bigger and stronger merged group to replicate its success here, overseas. Sunway Bhd, to be listed on Bursa Malaysia tomorrow, will be one of the largest property-construction players with total assets of RM7 billion and a landbank of 880ha with total gross development value (GDV) of RM25 billion and a market capitalisation of over RM3.5 billion. Within Bandar Sunway itself, Cheah said the group has at least 32ha more to develop, with the remaining GDV more than RM5 billion. "We want to be a world-class Asian property-construction group and this merger will be our growth catalyst," he said, adding that the group will be on the lookout to acquire other property companies to enhance its shareholders' value. PETALING JAYA: Major property developers have been snapping up large plots of land worth well over a billion ringgit, even as the global economic scene turned more cloudy. And it is interesting to note that these acquisitions are mainly located outside the country’s largest property market, the Klang Valley. Mah Sing Group Bhd, Hua Yang Bhd, S P Setia Bhd, Dijaya Corp Bhd, Berjaya Land Bhd and Eksons Corp Bhd are among the noted property developers that have this month announced acquisitions of land for future development projects. According to tabulations of a selection of notable deals by The Edge Financial Daily, five major developers alone have spent some RM1.07 billion to buy 1,502 acres (600.8ha) of land in the past few months (see table on Page 8). Factors such as scarcity of land in mature markets like Kuala Lumpur and Petaling Jaya, which has led to high asking prices, as well as future economic developments in other regions may have prompted the buying spree. Johor appears to be the new property hot spot now, judging by the rush of developers there. Analysts said the change of perception towards the southern state was triggered by the rejuvenation of Iskandar Malaysia. They noted that since UEM Land Holdings Bhd’s acquisition of Sunrise Bhd, there has been a more proactive development committee team spearheading the development of Iskandar. Sentiment has also been boosted by warming bilateral ties between Malaysia and Singapore, and maiden investments by Temasek Holdings is seen coming to Iskandar. In Johor, Mah Sing acquired 83ha (205.7 acres) of prime freehold land in Tanjung Kupang for RM54.7 million in April, or RM6.10 psf, while Hua Yang purchased two prime parcels of land in Johor Bahru measuring 0.8ha for RM10.7 million, or RM117 psf. Mah Sing’s land is located within the Iskandar Development Region, some 1 km from the Port of Tanjung Pelepas and 23 km to Jurong Industrial Estate in Singapore. It is proposing to develop the land into an integrated industrial and business park named Mah Sing i-Parc, with an estimated gross development value (GDV) of RM610 million. Last week, Dijaya acquired 92ha of freehold land in Plentong for RM220 million, or RM22.25 psf, in its bid to strengthen its presence in the Iskandar Malaysia development region. The company is building a mixed development named Tropicana Danga Cove with a GDV of RM2.8 billion. Construction of the project will start this year, together with another project called Tropicana Danga Bay, a high-end integrated property development with a GDV of RM3.8 billion. According to group CEO Tan Sri Danny Tan Chee Sing, Dijaya will be launching more quality properties in the region to ride on its proximity to Singapore. He said Iskandar Malaysia will drive up demand for properties in the region as more investments will be pouring in, especially from neighbouring Singapore. The rising cost of doing business in the island republic has prompted many of its small- and medium-sized enterprises to relocate to Johor due to its proximity to home and lower costs, according to a recent research. Hua Yang said its Johor Bahru acquisition is in line with its business expansion plan to make the southern region a key revenue contributor to the group. The move is also in line with its vision to become a nationwide community developer providing affordable homes throughout the country. The land parcels that it recently acquired are located in Jalan Abdul Samad in the Johor Bahru city centre and only 3.5 km from the new Customs, Inspection and Quarantine Complex. The land will be developed into a residential project comprising serviced apartments to cater for professionals working in Johor Bahru and Singapore, with an estimated GDV of RM120 million. So will the property markets in prime areas such as Kuala Lumpur, Petaling Jaya and Penang island disappear from the property developers’ radar? Not quite, but with limited large tracts of prime land, developers have been focusing on niche, higher-end projects. In the heart of downtown Kuala Lumpur, Mah Sing will develop a 1.7ha parcel at the former Tunku Abdul Rahman flats, better known as the Pekeliling Flats, in Jalan Tun Razak, in a joint venture with privately-held Asie Sdn Bhd and Usaha Nusantara Sdn Bhd. The project, tentatively called M Sentral, is estimated to have a GDV of RM9 billion. Mah Sing acquired the land for RM600 psf, and will look to jointly develop the rest of the former Pekeliling Flats land, which measures 58 acres. Hua Yang also has several projects in the pipeline in Kuala Lumpur, especially those under its RM840 million ‘One South’ integrated development located in Sungei Besi, south to the city centre. The project spreads over 16.7 acres and is currently enjoying high take-up rates, with its Phase 1 comprising retail and office units more than 80% sold. The group has also acquired 1.55 acres of leasehold commercial land in Desa Pandan, which is located near Jalan Tun Razak and the proposed Kuala Lumpur International Financial District (KLIFD). The land was purchased for RM32 million and the group plans to develop it into affordable serviced apartments with pricing in the range of not more than RM400,000, and a GDV of RM160 million. With limited prime land left in the urban centres, property developers would have to look much further out to build new townships. And that’s where SP Setia went to Hulu Langat, where it hopes to recreate another “Setia Alam” — its successful transformation of a backwater palm oil estate to a thriving township in less than a decade. SP Setia acquired 409ha of freehold land in Beranang, Hulu Langat, for RM330.1 million, or RM7.50 psf. The oil palm land will be converted into a mixed residential township with an estimated GDV of RM3.5 billion. Maybank Investment Bank Research said in a report that the property developer is spearheading a new relatively untapped trend of affordable housing development which will provide steady bread-and-butter sales to the group and support its long-term growth. The research house noted that the land could turn out to be another highly successful “Setia Alam” given SP Setia’s track record and expertise in developing townships. Up north, Penang continues to draw attention. Confidence in the state was summed up by Berjaya Group tycoon Tan Sri Vincent Tan. He said he was impressed with the level of cleanliness in Penang; the state has done very well economically over the past few years, having attained the highest level of investments in the country last year with RM12.2 billion. Berjaya Land Bhd acquired 23ha of land in the famed Penang Turf Club area for RM459 million cash, or RM184 psf for a high-end residential property development. The group said the project, with an estimated GDV of RM1.52 billion, will be a low-density, exclusive gated housing development comprising bungalows, semi-detached units and low-rise condominiums. The development will take five years to complete. Not only is the Penang island property market red hot now, the same could also be said about the property market on the mainland, Seberang Prai. Other than Tambun Indah Land Bhd, which has firmly positioned itself on mainland Penang property market after successfully building several notable townships such as Taman Tambun Indah, Juru Heights, Pearl Garden and Pearl Villas, Hua Yang is also making its foray into the market. According to the group’s chief executive officer Ho Wen Yan, the group is currently scouting for landbanks on mainland Penang as well as in Kota Kinabalu, Sabah. He said that the group is going to raise RM100 million to fund land bank acquisitions in these two key markets. “Penang is one of the high growth states in terms of economy and population. It is a target market for us to build affordable housing in the state. In Kota Kinabalu, we will look at building high-rise affordable residential property in the urban centres, whereas if it is outside the urban centre, it would be viable for us to build more landed properties,” he said during a press conference after the company’s annual general meeting last Friday. However, there are concerns over the various property projects in the more mature markets of Kuala Lumpur and Penang island , giving rise to fears that there will be an oversupply of housing. Penang, for example, has seen a surge in planned projects over the next ten to 15 years worth RM29.6 billion, according to news reports. At the current level of property purchasing in Penang, which is an all time high, it will take 10 to 11 years for the market to absorb such a large number of projects. Datuk Jerry Chan Fook Sing, the Real Estate and Housing Developers’ Association (Rehda) Penang chairman, had said property launches should be perfectly timed to suit demand so the many projects would not lead to an oversupply in the island’s property market which will dampen prices/yields. According to Affin Investment Bank property analyst Isaac Chow, there will always be demand in the medium- and low-cost property markets but the high-end residential property market will see slower demand, as buyers have become more selective and prices will be quite “shaky”, especially for high-rise developments. “The right property in the right location will see an increase in demand and hence price, whereas the wrong property in the wrong location will see lower demand and the price will decrease,” he told The Edge Financial Daily. He maintained that property prices in Malaysia are still generally affordable as only about 20% to 25% of a buyer’s monthly disposable income is spent on rent or mortgage payments as opposed to buyers in other countries who would have to spend almost 30% of their monthly disposable income on mortgages. With the recent turbulence in the global financial markets, amid fears of a recession in the US and Europe, developers are still confident in the property market. “Development is an industry that cannot slow down. Every 10 to 15 years, we have a downturn but we have to weather it and keep going. For us, it will be business as usual,” Dijaya managing director Datuk Tong Kien Onn told The Edge Financial Daily. KUALA LUMPUR: Malaysians should invest in India's property sector as prices are expected to increase five or six folds in the next five years, said Deputy Minister in the Prime Minister's Department Datuk S.K. Devamany. “The prices of properties and land in India are reasonable and can't be manipulated. Malaysians should grab this opportunity,” he said when launching the India Property Investment Fair here on Saturday. The two-day event showcases products of various property firms in India. Devamany said relations between Malaysia and India had grown stronger with the signing of the Comprehensive Economic Cooperation Agreement (CECA) between the two countries. The CECA envisages liberalisation of trade in goods and services, investments and other areas of economic cooperation. He added that the sister city agreement between Kuala Lumpur and Chennai, and the Little India in Brickfields had also helped strengthen the relations between the two countries. The pact presents an ideal platform for the two cities to come together in the fields of art, culture, tourism and economy. “This fair will further strengthen the relations between India and Malaysia,” he added.